Mix it up with your outdoor furniture, try to avoid purchasing the same dining table and chairs as your outdoor lounge. If you wouldn’t buy a matching suite of living room furniture, why would you do the same with your outdoor furniture? Consider using a variety of finishes and furniture styles. There is so much available now in outdoor furniture with teak, aluminium, cane / bamboo and plastic, we are spoilt for choice. Outdoor furniture is quite affordable and there are many bargains to be had at Ikea and KMart. Even better is checking Facebook Market Place or Gumtree for a second hand setting, then add your own individual touch with a coat of paint! My essential outdoor space furniture includes stools and side tables. These are perfect for resting your feet or popping your drinks and plates on… There are so many stools available that are perfect for the outdoors such as ceramic drum stools, metal stools or vintage timber stools. 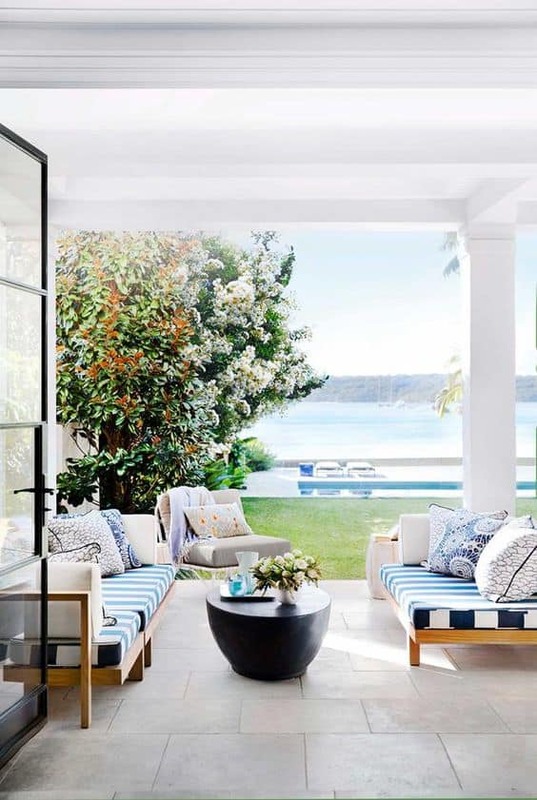 A Mix of Outdoor Cushions in a variety of prints and shapes give this outdoor space a relaxed vibe. We love Bunny Williams’ rule of not letting your outdoor space outshine all of the gorgeous nature around you. If you have a plush lawn, tree cover, or a beautiful garden, use your outdoor furniture as a way to enjoy those elements rather than distract from them. In the patio above, we chose a quiet color palette to really let the lush landscape be the focus. It’s a great lesson to remember, sometimes less is more. Large Pots make a statement in this space. Rather than cluttering up your outdoor space, consider accessorizing with greenery and flowers. Container gardens, small pots, and even trees in large planters are all you need to accessorize your space. My big tip is to use larger pots / planters to make a statement. I find that Stretzilia and Geraniums are perfect for adding colour on my verandah. A few large pots will look better than a collection of lots of little pots. Outdoor Living designed by Quercus Gardens, Sydney. 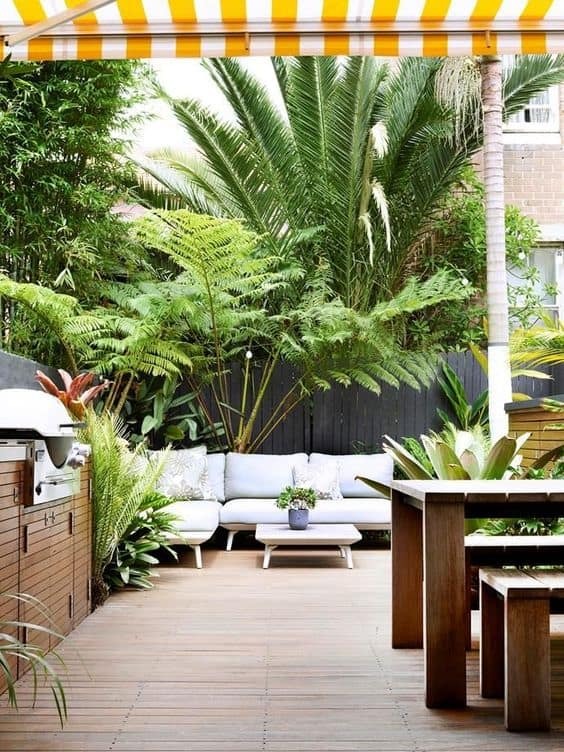 The tropical plantings are the focal point in this outdoor space. A mix of outdoor furniture create a casual chic outdoor space. 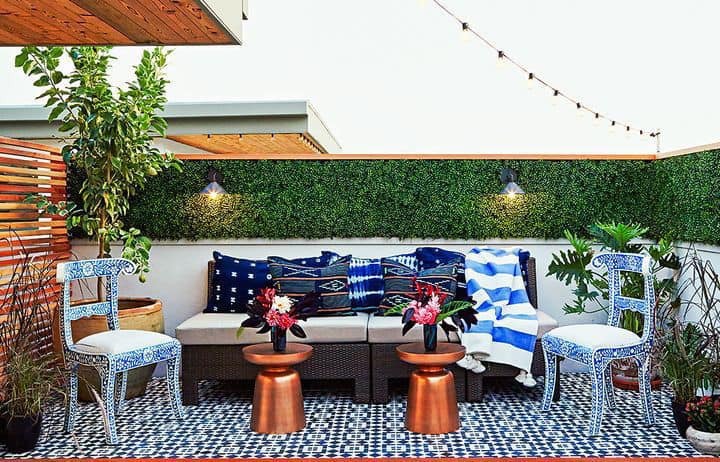 One of the most challenging parts of decorating an outdoor room is defining your seating area from the rest of your space. Without defining the space, your outdoor furniture can look like it’s floating on your patio or on your lawn without purpose. There are two great ways to do this. First, choose an area of your patio that naturally feels separated from the rest of your yard, like with a different hardscaping material or in an area close to your house. The other option is to use an outdoor rug which can link all of your furniture pieces together. 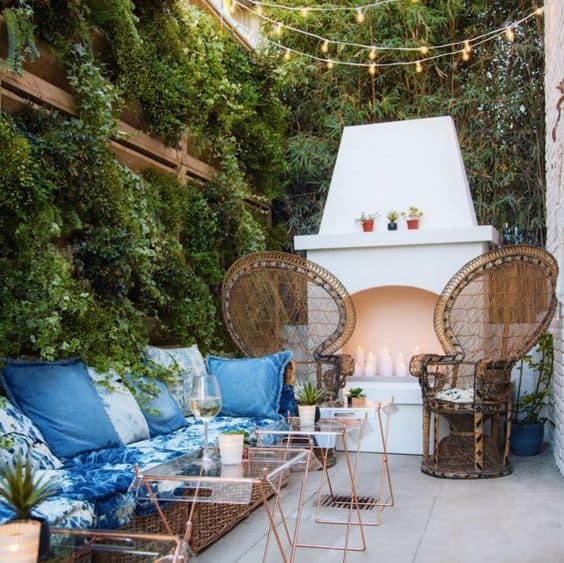 A mix of Outdoor Furniture creates a unique and welcoming outdoor space. Once you have your furniture it is time to accessorise with a few essentials to finish and personalise your outdoor space. 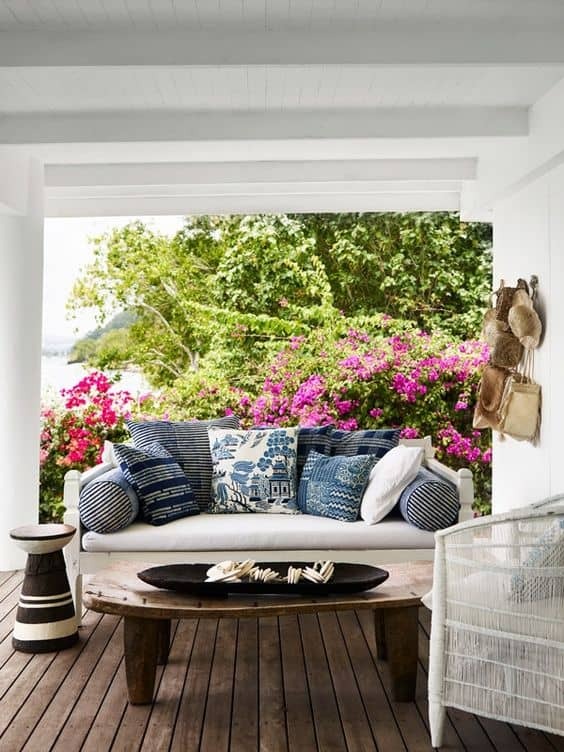 Outdoor cushions are the number one essential to finish your space. Again mix it up, with a variety of sizes, prints and colours. Stripes always look good and will team well with a geometric or botanical print. It will only take a few cushions to add a little colour to create an alfresco appeal to while-away the afternoon. Candles and lanterns are essential when the sun sets! We have plenty of citronella candles on hand to keep away the insects. A blue tooth speaker is also great for music to set the mood for your outdoor gathering. Throws are also handy in the cooler months when the evening starts to get a little chilly. This is outdoor space is defined by the large outdoor rug which anchors this space. 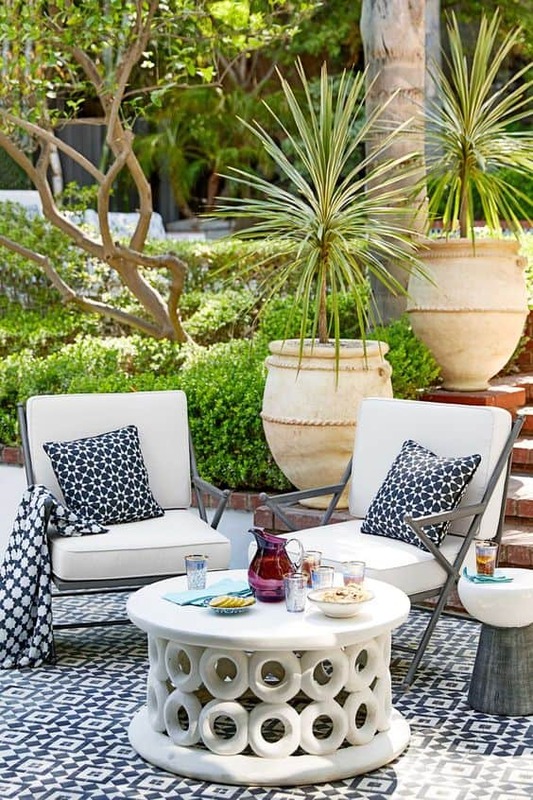 Candles, Side Tables & Outdoor Cushions create a relaxed casual outdoor space.